If You Can’t Beat ’em With GPS, Just Add Augmented Reality! 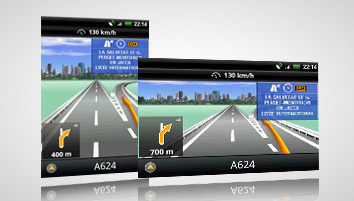 Navigon today introduced its MobileNavigator software that brings GPS navigation to Google Android phones in the U.S. The software is available for an introductory price of $39.99 for the next two weeks, then reverts to a standard $59.99 price tag. Like the free Google Navigation (s goog) that works on Android 1.6 or better devices, MobileNavigator offers spoken turn-by-turn directions, traffic data and maps in both 2-D and 3-D views. So how can a paid app like MobileNavigator compete with a free Google offering? With augmented reality! Navigon’s new software includes a database filled with points of interest (POI) just like most other mapping solutions currently available. The difference and potential value-add is how it can be accessed. 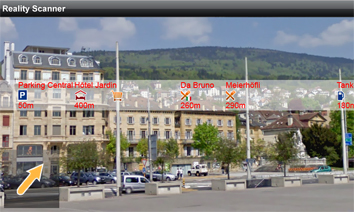 MobileNavigator uses the integrated camera of an Android smartphone to “see” what’s around. Through the GPS radio and compass in the phone, the software knows what cool places are nearby and it superimposes them ont0 the real-time camera Reality Scanner view. At $40 or more for the software, this virtual reality feature isn’t likely to sway many Android device owners from the free navigation software already available for their handset. I wouldn’t use this feature while driving, although I see tremendous benefit once I’ve arrived somewhere and can walk around to explore. That’s the additional benefit. Navigon’s latest effort shows that traditional navigation companies aren’t just going to roll over for Google. That’s important due to the expected growth the GPS and associated location-based markets, which is pegged to be a $28.9 billion market by 2015, according to Global Industry Analysts Inc. When Google launched its Navigation software for Android last year, I thought standalone GPS companies would start dying a slow, painful death. I’m not suggesting that augmented reality features will turn the tide back in favor of navigation companies, by any means. However, thanks to smartphone hardware, software and a little innovation, these companies are still traveling down the road. Navigon’s augmented reality feature is interesting for the purpose you mentioned, but I’m not sure it’ll be perceived as worth the premium above what CoPilot is asking for its Android navigation app (much less “free” Google Navigation). I see the incumbent GPS companies (including TomTom and Garmin) in gyrations as they try to discover the right price points and business models to be successful in the brave new world of smart devices.